A harsher-than-usual and prolonged winter is increasing the pothole repair workload for many state departments of transportation. The Missouri Department of Transportation reported on March 18 that its crews patched 400,000 potholes through the first two months of 2019, compared to the approximately 619,000 potholes they patched for all of 2018. The agency said in a statement that it plans to keep 300 pothole patching crews busy statewide making roadway repairs through April. She noted that her agency’s repair crews address the deepest potholes first and that, until roadway temperatures rise and remain above freezing, repairs are made using a cold asphalt mix – adding that MoDOT spends approximately $15 million a year on pothole patching operations for the 34,000 miles of road it maintains. The Ohio Department of Transportation noted in February that it had already used 2,574 tons of asphalt to repair potholes; up from 1,892 tons at the same point in time in 2018. 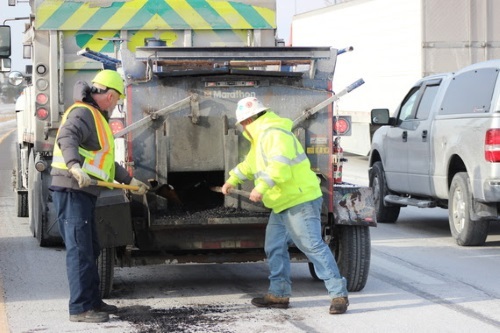 “Our crews have spent more than 39,000 hours patching potholes this winter,” noted Jack Marchbanks, ODOT’s director, in statement on February 1. He added that potholes are a “common nuisance,” particularly during the winter season when the freeze/thaw cycle weakens the pavement. This happens when water seeps into cracks in the pavement, then expands as it freezes. When temperatures warm up, and the ice melts, the pavement contracts, allowing even more moisture in to freeze and thaw. The agency noted that in fiscal year 2018, it patched approximately 25,000 square yards of potholes at a cost of approximately $3.1 million, with the average cost to repair a pothole ranging around $95, which includes the cost of materials, labor, and traffic control to protect workers during repair operations.